Hannah Genders picks out three of her favourites at Chelsea Flower Show. There was so much to celebrate at this year’s Chelsea Flower Show and it really felt like everyone had pulled out all the stops to enjoy the 100th anniversary. One hundred years ago in 1914, The Great Spring Show, as it was called then, moved to the Royal Hospital site in Chelsea where it has remained ever since – and it has continued to be at the forefront of horticultural excellence throughout the world. The show gardens this year were some of the best I’ve ever seen and this was reflected in the medals with more of them winning gold than ever before. There were three gardens that I particularly loved for different reasons, and it was very hard to choose just three. Although there was a strong sustainability theme in my choices, I also felt these three gardens summed up my reasons for finding the Chelsea Flower show such an inspiration. The Australian garden – which for the first time was situated on the rock bank, meaning it had a ready-made slope to work with – was all about sustainability. 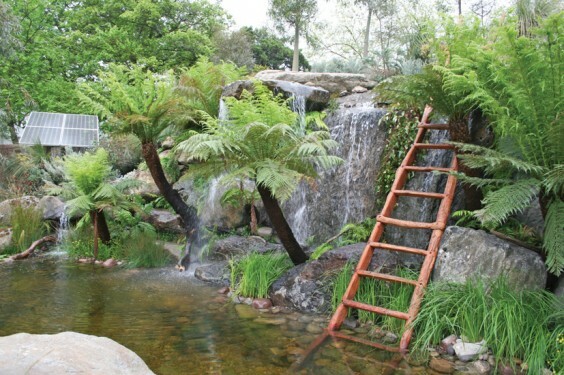 Designer Philip Johnson had recreated a natural swimming pond with rocks and a waterfall (pictured above), all in his native Australian style. Philip told me this was just like his garden back home and his passion was to get people to engage with their local landscape through his gardens, down to the detail of recording the frogs in his own back garden and then playing the sounds at Chelsea. The billabong was for water capture and acted like a balancing pool as the level goes up and down according to the amount of rainfall. All the planting was native to the region and so to us looked very exotic, and the outstanding feature was a suspended artist’s studio above the water which was designed around a native flower structure. When you were in the studio space, the wooden petals which created shade from the midday sun disappeared and just gave you a fabulous view out over the billabong and to the whole showground beyond. The garden was sponsored by Fleming’s Nurseries in Australia and the reason I feel some personal connection with this one is that I know Wes Fleming who runs the nursery. Wes has headed up the Australian show garden team for the past nine years and their first garden in 2004 was just along from my Chelsea garden, so we were neighbours. They have brought a breath of fresh air to Chelsea and their garden in that show was the only place you could get a beer, as most of the showground only served champagne and Pimm’s. Every year since then, I’ve caught up with Wes and the team at Chelsea and, for me, their garden this year was the best they’ve ever done. The judges agreed and it won not only a gold medal but Best in Show. This means their garden scored the highest number of points over any other show garden – what an honour and a great way for Wes and the team to celebrate his last garden at Chelsea. The Blue Water roof garden also had reasons to celebrate; this won a first gold medal for designer Nigel Dunnet who, I must confess, is a bit of a hero of mine for the gardens he has previously exhibited at Chelsea and for his wonderful naturalistic planting at the Olympics site. Nigel is a leading light in sustainable design, particularly for his use of recycled rain water. This roof top garden was designed to be in an urban environment, to increase biodiversity and help “green up” our city landscapes. In a similar way to the Australian garden, this feature was all about connecting people to a green landscape even in the middle of a city. The garden was irrigated from the rain water runoff and was full of habitat-rich planting for bees and butterflies, from the blue poppy Meconopsis, which loves the damp conditions, to swathes of purple vebascums running along the front edge of the garden. The simple building acted as a backdrop to the garden and had a low-tech “living wall” made from planting succulents into clay pipes – it really was stunning and although it contained a strong and important message about water and greening up, it was also just beautiful to look at. The other Chelsea feature to mention is the small gardens, or Artisan gardens as they are called. These are tucked away in a section called Ranelagh Gardens and are always worth seeking out – this is where I did my first Chelsea garden ten years ago and I can remember how excited and nervous I was. The garden that caught my eye this year was by some newcomers to Chelsea, too. Brothers Harry and David Rich have just finished studying Landscape Architecture at Leeds University and decided to try their hand at doing a garden at Chelsea. These gardens measure only five by five metres maximum and so the best idea is to keep it simple and strong. This they achieved beautifully by using just one type of stone, inspired from the landscape they grew up in near the Brecon Beacons in Wales. The effect was a very clear message of sustainability and a celebration of a local and known landscape of rocks, set off by natural planting – a simple idea became a very attractive garden. They won a well-deserved gold medal and I’m sure we’ll be seeing more of these two in the future if this is how they start out. This is another thing the Chelsea Flower Show is good at: it encourages new and up-and-coming talent to have a go. So here’s my thought – it’s time, as a nation, to celebrate what we do well: making a proper cup of tea, queuing in an orderly fashion and putting on the greatest flower show in the world!